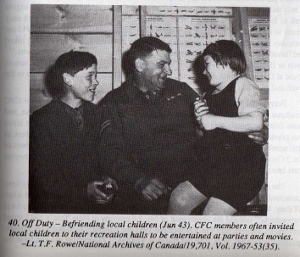 family members of the Canadian Forestry Corps to this website. 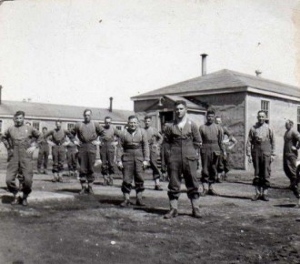 8/9/40 – Company arrived at Valcartier Camp, PQ. 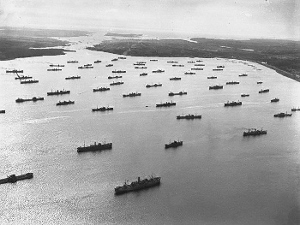 7/2/41 – Company arrived at Halifax. Embarkation delayed. 17/2/41 – Sailed for United Kingdom. 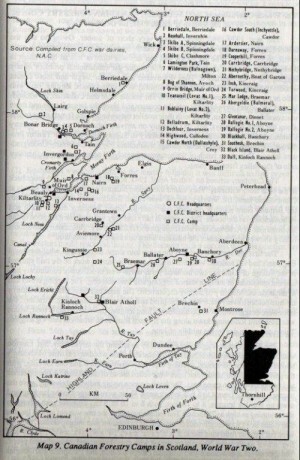 1/3/41 – Arrived in Scotland. 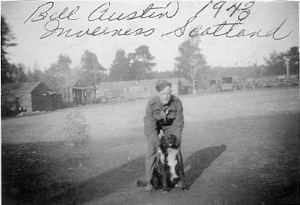 7/10/43 – Cease operations in Scotland and returned to Canada. The war created a crisis in wood supply for the United Kingdom. Pre-war domestic production covered only a small fraction of the timber needed to support the war effort. 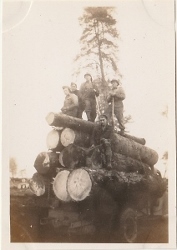 In addition to civilian requirements, it was estimated that every soldier needed five trees: one for living quarters, messing, and recreation; one for crates to ship food, ammunition, tanks, and so on; and three for explosives, gun stocks, coffins, ships, factories, and direct or indirect support for the fighting line. Canadians stepped up to fill this need. During 1941 and 1942, thirty companies drawn from all regions of Canada, totalling 220 officers and 6,771 regulars, were deployed to Scotland. Also it takes a number of support soldiers for each fighting soldier. We did load a ship with lumber, yeah. And it went to Africa and I took a chalk and I wrote my name and address on the board. I get to, it was about a month after, first thing I get this letter from the soldier in Africa. He says, "I want to tell you, he said, that you people, your job is important," he said, "We used your lumber today, we landed in Africa. Once again the British Government turned to Overseas Woodsman to assist in the war effort. Given their impressive record in World War One it was natural that they looked to Canada to provide forestry units once again. 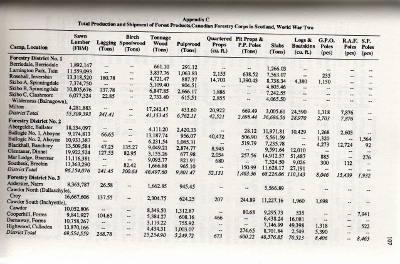 In May 1940 the Canadian Government decided to form a Canadian Forestry Corps. 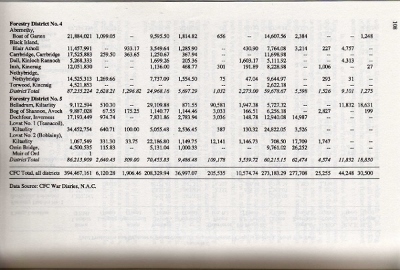 Twenty Companies were initially formed with ten more as the war progressed. The financial agreement between the two Governments as similar to that in World War I. Canada would bear the cost of pay, allowances and pensions, all initial personal equipment, transport to and from the United Kingdom. The British Government paid for "all other services connected with equipment, work or maintenance" and certain others, including medical services. Canada covered the cost for Medical Officers and Britain paid for hospitalization. 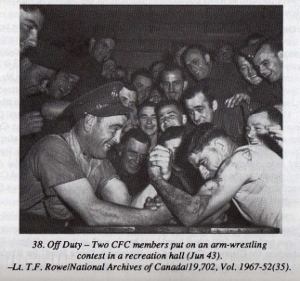 The arrangement was unusual as it resulted in a Canadian Unit working for the British, who controlled the areas of work and disposal of the product, but Military operations of the C.F.C. was never surrendered by the Canadians and came under command of Canadian Military Headquarters in London. Even though the C.F.C. had to serve two masters, no serious problems ever resulted. 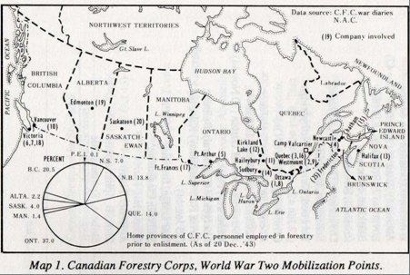 Mobilization centres for the Corp spanned all across Canada, and recruited both English and French speaking personnel. Many of the volunteers were veterans of World War One, including the Corp's Commander, Brigadier- General J.B. White. 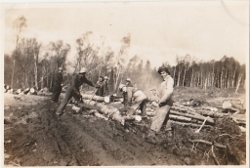 Many of the men carried out the same duties as they did in civilian life, such as loggers, black smiths, lawyers, store man, cooks and clerks. The big difference between the new Corp and their World War One counter parts were the new Corp were considered Combat Troops. 20 companies was mobilized and what percentage from each province the men came from. No 11 District Depot was located at Bay St. Armories, Bay St., Victoria, B.C..
Where the Recruitment office was set up for the No. 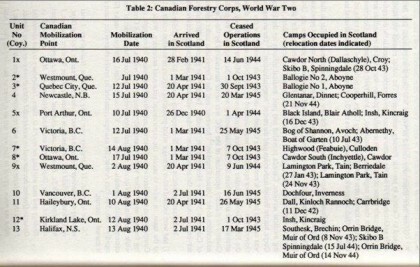 7 Company, Canadian Forestry Corps and the men would sign up in the month of Aug 1940. It was originally a relief camp during the Great Depression and closed for that purpose in 1936. Disembarked 0945hrs 1 Mar 1941 at Gournock after two weeks at sea. Canadian soldiers aboard a troopship arriving at Greenock, Scotland, 31 August 1942. Men were housed in huts accommodating 14 men each. A cookhouse, ablution hut with hot and cold showers, sergeants' quarters and mess, officers' quarters and mess, orderly room, medical hut, quartermaster stores, garage and workshop were present in the camp. Several camps had garden patches to provide fresh vegetables for the men. Swill from the messes was sold to local farmers and the income spent on the messes, or some companies kept pigs and the swill was fed to them. On reaching maturity the pigs were sold to the RASC. 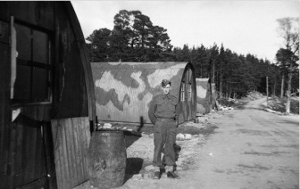 Rather than have to purchase young pigs, one company at Cawdor North Camp decided to raise its own, but discovered pigs do not always obey army orders: "17 March 1942 - Delighted to notice that one of our sows is pregnant. We had come to the conclusion that her several trips to the boar had provided her with diversion only." The No. 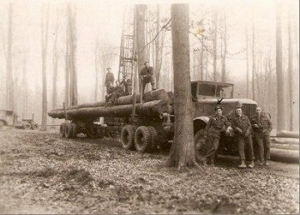 7 Coy brought with them the most up-to-date logging equipment then available in Canada. They brought a standard medium type rotary mill with a capacity of 1500-2000 bd. ft. an hour or c. 8,000 cu. ft a week/3-5-4-7 cm an hour or 227 cm a week. (The British Forestry Commission also provided the company with a Scotch mill or bench, but these were not popular with the Canadians.) Power was supplied by 100-horsepowe Diesel generators. 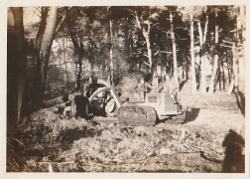 Logging equipment included TD9 caterpillar tractors, lorries, sulkies (pneumatic-tired arches), angle dozers for road making, and two and three drum winches for high-lead logging. They also were equipped with a variety of transportation vehicles, four tractors, two sulkies, one motorcycle, and originally six bicycles. Various factors accounted for the longer start-up times. No. 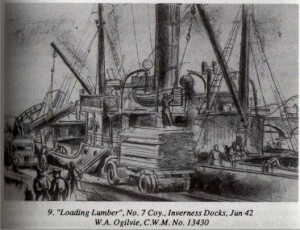 7 Company at Highwood Camp was correcting some of the immediate faults of their supposedly completed camp and was called on to assist in loading ships at Inverness. 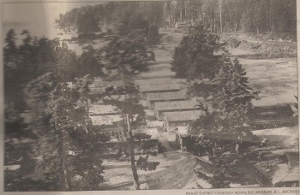 Several companies had to complete camp construction, construct roads and bridges. No. 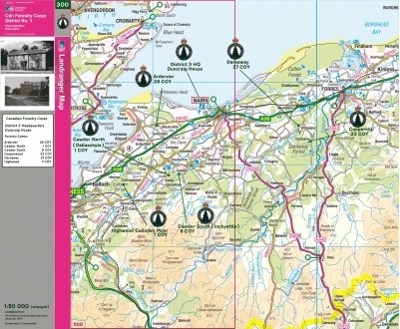 7 Company arrived at Highwood Camp on 1 March 1941; over a year later, in July 1942, it was observed that a "cordial relations exist between ourselves and the public of the Inverness district. Men from No.7 Company at Highwood Camp attended dances at Raigmore Military Hospital in Inverness, and in return nurses from the hospital attended dances at Highwood Camp. 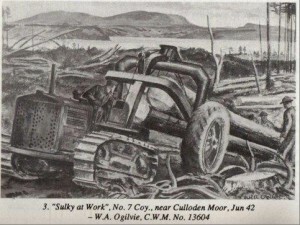 A large fire broke out near historic Culloden Moor about 2200 hours on 29 April 1942 and a fire-fighting crew of 100 men from No. 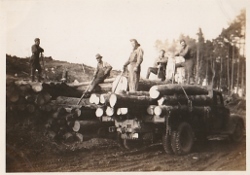 7 Company at Highwood Camp brought it under control by 0300 hours next morning, occasioning the comment "The men are splendid fire fighters and have evoked the admiration of the Forestry Commission for their efficient way of tackling the job of extinguishing fires. 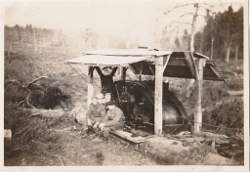 Even before felling could begin most companies had to introduce an access road network in the forests to enable their mechanized equipment to be used, in contrast to the widespread use of horses in prewar local forests. Road building and maintenance continued to occupy part of the CFC personnel even after the initial period. 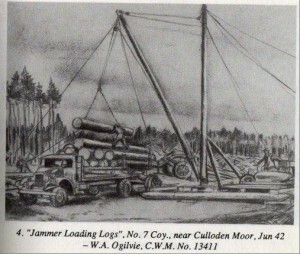 The heavy-laden Canadian lumber lorries from mills to shipping points placed a great deal of strain on local roads and access roads even when they were gravelled, particularly during rainy periods. 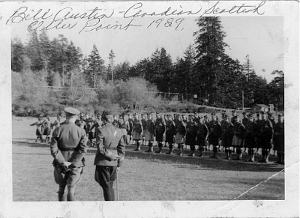 In addition to meeting its primary objective the Canadian Forestry Corps' presence in Scotland was influential in other ways: as a defensive element in the earlier years and as a social factor in many smaller communities. It was common practice for the forestry workers to pilfer some of the vehicle fuel ration to give to the local taxis in exchange to a lift to the village to the bar and dances. It is known that a number of Lumber Jills worked in the camps in the Highlands of Scotland. 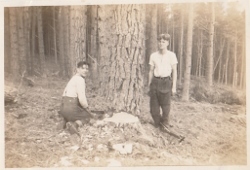 They were mainly involved in measuring the timber as the landowners were paid for the timber removed from their land. The military role of the CFC as distinct from its industrial role was important, particularly during the period of possible German invasion after the fall of France. Personnel were allowed to wear civilian clothing while working, but uniforms were required for military activities and when on leave. 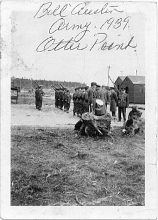 As combatant troops they received additional training on Saturdays after their week's work in the woods. This included practice on rifle ranges and tactical exercises with other military units. Periodically they participated in weekend military schemes in their areas. CFC lorries often were called on to transport personnel of other units as well as its own. 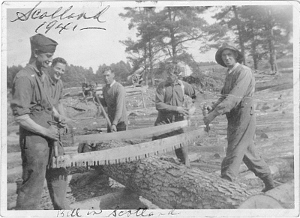 Companies usually worked in two sections, "one cutting 'in the bush' and bringing out the timber, the other sawing it into lumber in the company mill, and both using mostly Canadian mechanical equipment," The relative openness of the cultivated Scottish forests in contrast to the tangled undergrowth of most natural Canadian pleased the CFC. 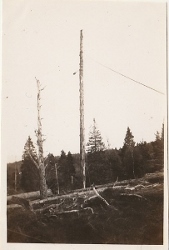 Nevertheless, pressure had to be applied to Canadian fallers to cut trees close to the ground in Scottish fashion, rather than higher up, which left unsightly stump-fields so common in home forestry operations. 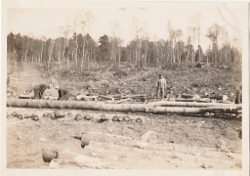 The felling crew consisted of three men, two sawing down and one trimming or limbing. Hand saws and axes were the tools employed. 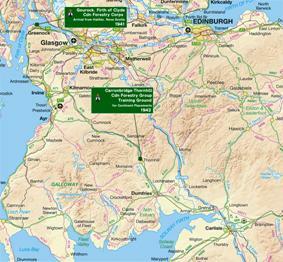 The trees involved reflected the variety of Scottish plantations, with Scot pine, spruce and larch particularly common, but also Douglas fir and hardwoods on occasion. CFC companies transported and sold scrap wood from the mills to the public for fuel, at prices and delivery charges fixed by the Ministry of Supply. At times some scrap wood "mysteriously`` fell from lorries to land beside individual homes in financial need. In the No. 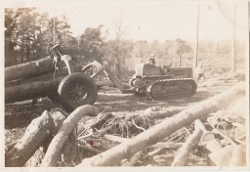 6 Coy War Diaries there are many entries of soldiers being injured in the mills or the forest falling trees and on the roads. A soldier toes being chopped off with an axe and another soldier losing fingers in the saw in the mill. 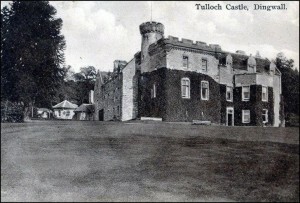 There a good many soldiers injured and sent to Tulloch Hospital in Tulloch Castle, Dingwall. 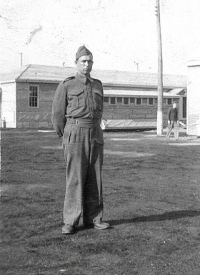 Members of the CFC were seen in uniform regularly at local parades in support of varied wartime causes. 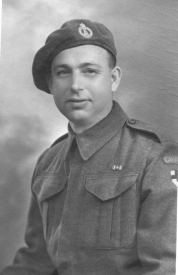 In addition to their distinctive cap badges and shoulder patches, from Mar 1943 the CFC were identified by a green triangle below the 'Canada' flash on the upper arm of the battle dress. The CFC was apparently well liked in the Scottish Highlands. The men became active participants in local functions, from fundraising to staging Christmas parties for the local children. 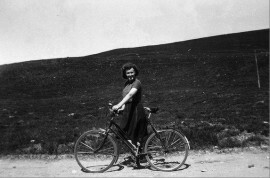 A notable tribute to the CFC was paid by Laura Lady Lovat when she stated, "you Canadians may be cutting the Scots firs of the Highlands, but in Highland hearts you are planting something far more lasting". Church parades also brought them to the public's attention as the No. 7 Coy made use of the local church buildings as well as holding religious services in the camp. 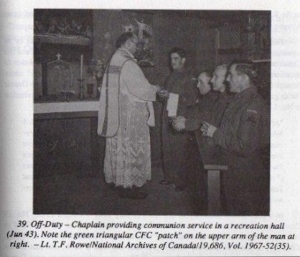 The Chaplains of the Canadian Forestry Corps were attached to CFC HQ or to one of the District HQ to serve the needs of the soldiers. 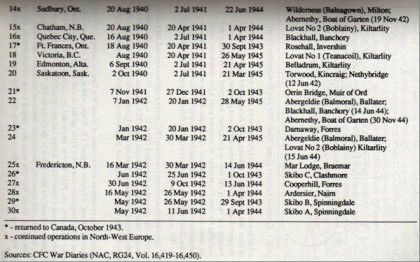 First, as Clarks father and Williams second son I wish to personally thank you for your kind efforts to place time lines/ some form of historical records to dad’s career in the army during the war. funny how memory's come back to you, I remember dad talking about being a first aider or hospital orderly, it comes to mind him telling me he had to pass some test in front of a doctor to prove he could stop someone from bleeding to death. I have an old triangle bandage somewhere down stairs with ink drawings of various wounds and fractures and their treatments. The drawings seem much older the 1940's and was probably from another era. Dad use to complain all he had for dinner was Bully beef, I'm not sure what that is, but probably mutton. Which thankfully we had very little of when I was growing up. For years no one knew where my grandfather, Frederick John Demean, grew up or even where he was born. His life just seemed to start when he got married in 1928. So, for the years from the time he was born in 1904 to the time he got married in 1928 was a total blank. That is, until I sent away for his Military Records. It gave a complete history of his life as to where and when he went to school to the places that he worked. My mother had written many stories of the family as she was growing up. Among them was the day my grandfather went off to join the Army. 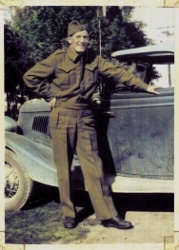 She wrote, “My father joined the Army when I was eleven years old or so and being the oldest of six, I got to know him better than the rest of the kids. After he went into the Army, my mother was left to raise the six of us on her own until he returned. This was about 1940. Since I am now into the genealogy and doing our Family Tree, I keep discovering more and more about my grandfather. It was so interesting to find your website on this Remembrance Day weekend as if I was meant to find it at that particular moment in time. 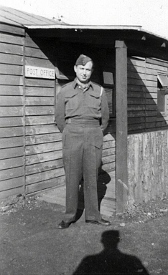 I am attaching some photos of my grandfather of his time in the service. My name is Eric Johnson and I am the son of George Johnson (K99191). I found your web site on the Canadian Forestry Corps. Excellent I might add. I am researching his life,knew he was in the war but being a quiet man never told me of any part of his life at that time. Also am enclosing a another picture I have, he is on the last row third in on the right hand side. I do know he enlisted when he lived in Victoria and I believe the year was 1939. He did end up in Germany working for the North German timber control and the Foreign office. I do have some papers I am still working on and will send whatever info I gather on the 18 Corps. Good morning Bob and thank you so much for your reply. It has been so interesting researching the man behind the uniform. After e-mailing you, I found even more items belonging to my Great-Grandfather - William Charles Mobley. In addition to his pants, hat and jacket I found a bomber style jacket, a full-length coat, 2 flat hats, his helmet, a pair of pantaloons, a dickie and a pair of mittens. 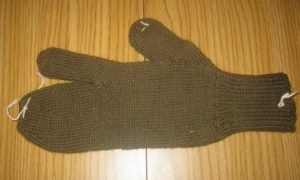 For today I am just sending pictures of the mittens and the tie clip. I think once you see the tie clip you may change your opinion on its origin...I don't know! 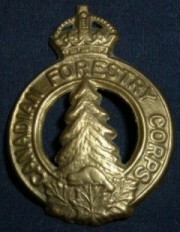 The photo of the pin is taken atop the Coy photo of the Canadian Forestry Corp No. 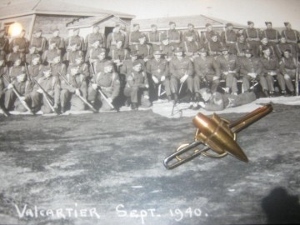 7 in Valcartier 1940. Major Mobley is third from the right and he is not looking at the camera. Interestingly...my Grandfather, William Charles Mobley (age 19) is also in the picture! I will try to forward photos in the near future, but for today just the mitts and tie clip. Thanks for your time and have a great day! Mrs. J.M. Rae of the city has just received word that her son Lieut. W.H. Rae of the Canadian Forestry Corps has been promoted to the rank of Captain. The Local soldier has been stationed in Scotland since going overseas three years ago. No. 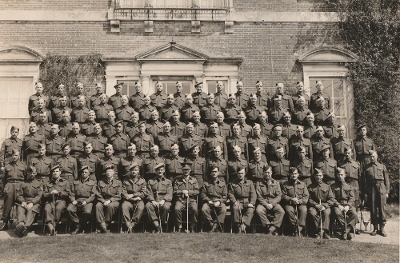 7 Coy CFC started out with 204 soldiers in 5 Aug 1940. Over the years this company saw a large movement of men before the company came back to Canada. Nordquest, John Frederick Pte K99039 edgerman "B"
Perrault, Walter Pte K99112 log canter "C"
Pickering, Thomas Patrick Capt C63496 Transf from No.8 Coy & OCTU & No.24 Coy & No.6 Coy transf to No.5 Coy & No.16 Coy - See No 8 CFD transf to Miltary Gov.